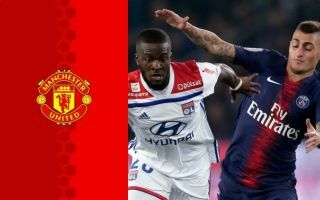 Manchester United are among the Premier League clubs again being linked with a transfer swoop for Lyon midfield sensation Tanguy Ndombele. The 22-year-old has had a superb season in Ligue 1 and the Champions League, looking one of the finest young players in Europe and a dead cert to be on the move to an elite club in the near future. And according to Calciomercato, despite interest from Juventus, Man Utd and other potential Premier League suitors could have the edge in the battle for his signature. The report explains that English sides may be better-placed to match Lyon’s financial demands for Ndombele, who they say would cost at least £63million. United will surely be looking to splash out on a new midfielder of that type, with Fred largely flopping since joining from Shakhtar Donetsk last summer. Nemanja Matic also looks past his peak, while Marouane Fellaini recently left Old Trafford, meaning Ndombele could clearly come in and be a key player for the Red Devils straight away. United fans will surely be hoping they can edge the likes of Juventus, Manchester City and Tottenham, also mentioned as suitors by Calciomercato, for the France international’s signature this summer. Juve, for one, probably don’t need to be making an expensive signing like this a priority as they’re already set to sign Aaron Ramsey on a free transfer.